A hearty salad, side dish, even meatless main meal that comes together in a snap! Have you tried quinoa yet?? While this whole grain has been commonplace for a while, I know many people that have still never tried it (and have difficulty pronouncing it!). Pronounced "keen-wah", it is actually a seed that is high in protein and a good source of B vitamins and iron. It has a slight nutty flavor that is complemented in this recipe by the peanut butter and chopped peanuts. Using prepackaged coleslaw mix keeps this recipe super-simple to make and saves a lot of time but feel free to use shredded cabbage instead. 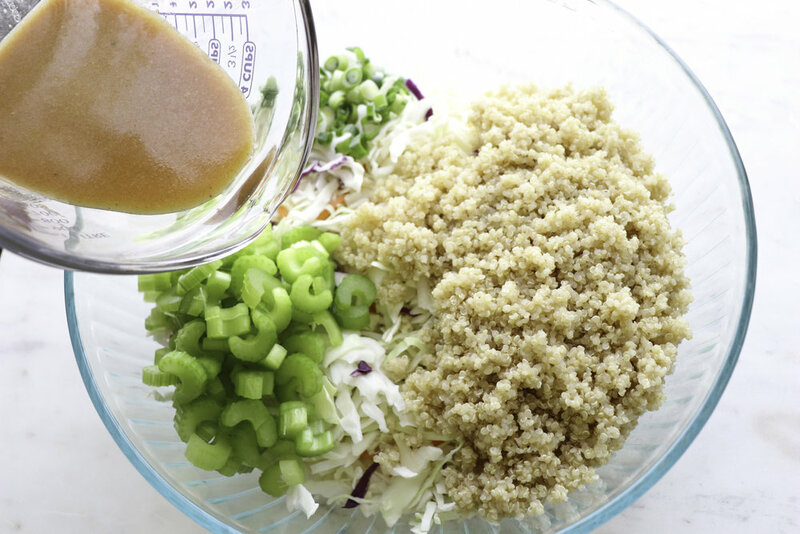 If using plain cabbage add in some grated carrots for extra crunch and flavor! This slaw will keep up to 2 days in the refrigerator but is best served the day it is made. Reserve the chopped peanuts and add just before serving. Place slaw ingredients in a large bowl. Mix all dressing ingredients in a jar with a lid and shake to combine or whisk together in a bowl. Pour over slaw and toss gently. Add chopped peanuts just before serving.